First time I’ve heard about OISTAT was in 1999 during my second participation in the Prague Quadrennial – PQ ‘ 99, when the organization launched a parallel program of meetings, alongside the PQ, between the scenographers who were attending the event and the public. It was a precise answer to my restlessness in face the PQ ‘ 95 Exhibition, when I strongly missed meeting people and exchanging thoughts, ideas, etc… as a complementary activities to the amazing showcase that is PQ event. Since then the focus on PQ has changed and consequently my grew interest to go back every other time because it became, from that point, a fruitful meeting place, unfortunately I would need to wait another 4 years for the next event. Though, through the OISTAT I found out the meetings, discussions and exchanging experiences could happen more often by following the OISTAT Activities and programs. In 2003 I become affiliated as an individual member and started to attend to the meetings following the Education Commission, when I started collaborating with it, what I never stopped since then. Is important to make clear that everyone within the OISTAT, collaborates as a volunteer. In 2007 by the joint efforts of two groups in Brazil: CenografiaBrasil and ABrIC, we founded the first OISTAT Centre in Latin America. What is OISTAT? How does it work? This is a non-governmental organization, recognized by UNESCO and which has existed for more than 40 years founded in June 1968 in Prague, by initiative of ITI International Theatre Institute which reunited theatre experts from 8 countries, and for the founding meeting included including the representatives of the Czechoslovak Ministry of Culture and the representatives of the Czechoslovak Association of Drama Artists, and it was initially called Organization of Scenographers and Theatre Technicians – OISTT. At that period, a great interest was growing on the development of scenography and costume art worldwide. In particular, influenced by the great success of Czech artists participation in important international Arts events as such as the Bienal of São Paulo and the Paris Arts Salon, what resulted in the implementation of the Prague Quadrennial in the year 1967. It was the moment and the opportunity to establish, in Czechoslovakia, a basis for the development, documentation, exchange of experience and knowledge reuniting scenographers and theatre experts. The commissions and groups usually meet once each year. Every centre is encouraged to send a delegate to the commission meetings; invidividual members of OISTAT are most welcome to take part in the commission meetings. The principle of the OISTAT activities is based on mutual invitations, extended by the centers. They extend invitations to a commission to meet in their country. Every four years, the commission elects a chair whose job it is to organize the meetings as well as the activities between meetings, propose themes and coordinates the projects. WSD – World Stage Design is an event to celebrate the design of performance by exhibiting professional practitioners, who the can apply independently for taking part in the exhibition. It happens every four years, in the interval of the PQ and every edition in a different location around the world. 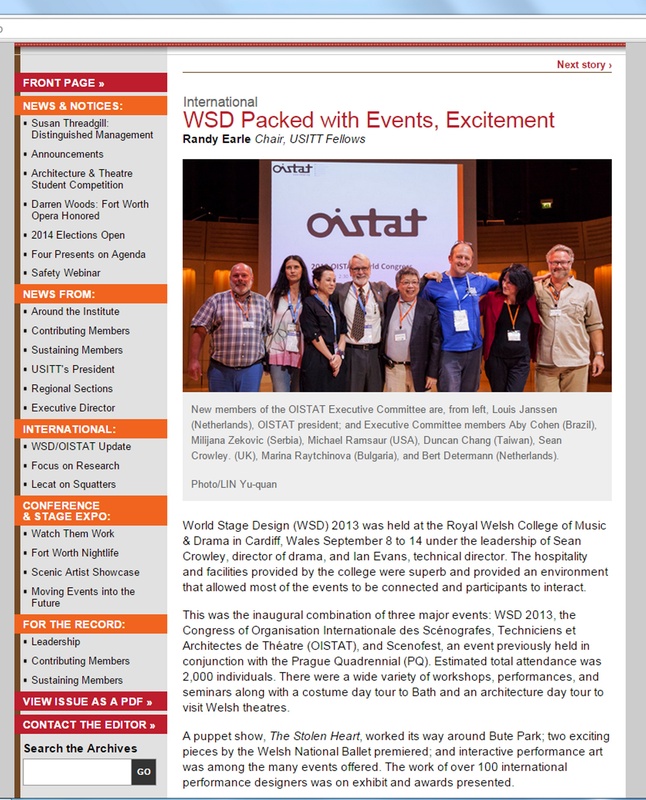 The first WSD was in Toronto, 2003, followed by Seoul, 2009 and the most recent was in Cardiff, 2013 which received more than 600 entries and culminated in the exhibition of 116 designers, representatives from about 30 countries. The next edition, in 2017 will take place in Taipei. The SCENOFEST was launched in 2003 in development of the OISTAT side program at Prague Quadrennial. After 3 editions linked to the Prague Quadrennial – in 2003, reuniting more than a thousand students, educators and professionals – in 2007, a very rich and successful event, attracting more than 7000 students and professionals from all over the world – 2011, focused on workshops and live performances; the SCENOFEST moved to exist in parallel with the WSD – World Stage Design since 2013, creating a platform event of live performances, workshops, presentations, education and research.